Eight countries have entered the Oceania Sevens – the biggest ever entry – including New Caledonia, who are making their championship debut, and Nauru, who are making the international sevens debut. Fiji, Australia and New Zealand will be the clear favourites. Both Australia and New Zealand are using the tournament as a development opportunity. Australia’s Manager Dale Roberson described his squad as a mixture of experienced players and new and rising talent. “The Oceania Rugby Sevens Championship has become an important part of Australia’s preparation for the HSBC Sevens World Series. It is an elite tournament, with great opposition to play from all over the region” Roberson said. New Zealand development team coach Crystal Kaua is in charge of their team and said exposing the next level of sevens talent to international competition like this is crucial in the development of players. “Our job in this development team is to get this group of players that are behind the fully contracted squad ready to transition into that space. It really is a stepping stone to that Black Ferns Sevens squad and we have already seen players graduate from this team into full time contracts. We are together for a short amount of time so we want to get these players in an environment where they can be confident and express themselves on the field. The has experience in the form of Black Ferns Sevens players Shakira Baker, Terina Te Tamaki and Huia Harding. “Those girls bring a lot of mana to our environment, they are very willing to share their knowledge and want the players around them to do well. Papua New Guinea: From: Geua Larry, Marie Biyama, Taiva Lavai, Cassandra Sampson, Joanne Lagona, Chelsea Garesa, Michaelyne Arumbi, Kymlie Rapilla, Fatima Rama, Gwen Pokana, Yolanda Gittins, Marlugu Dixon, Gemma Schnaubelt, Anika Butler, Melanie Kawa, Coach: Paul Tietjens, Team Manager: Ann Mooney, Physio: Hendriella Vilosi. Four teams will converge at Lautoka’s Churchill Park next month to contest the 2018 Oceania Rugby Women’s Championship. Papua New Guinea, Samoa, Tonga and hosts Fiji will play in a three round robin tournament on Friday 16, Tuesday 20 and Saturday 24 November in opportunity to showcase and promote International Women’s XVs Rugby in Fiji and the Pacific. Samoa are returning to test rugby for the first time since 2014 while Tonga it will be playing their first test rugby since 2006. “We are entering some exciting times in the region for Women’s Rugby, and we are delighted to have four teams from within the Pacific take part in this year’s Oceania Rugby Women’s Championship,” said Bruce Cook, General Manager of Oceania Rugby. He said the immense amount of interest and growth in Women’s Rugby is tremendous, and that Oceania Rugby continues to see a huge number of girls taking up rugby the various GIR (Get into Rugby) and GIR Plus programmes. “The Championship will serve as key development and performance pathway for our girls and young women, especially in the Pacific. It will provide an opportunity for our aspiring young women from the region to represent their countries and play regular International Test Rugby,” Cook added. The runners up from 2016, Papua New Guinea will open the championship against the Manusina from Samoa, while defending champions the Fiji Airways Fijiana will face off against Tonga in the final match of Round 1 on Friday 16 November. 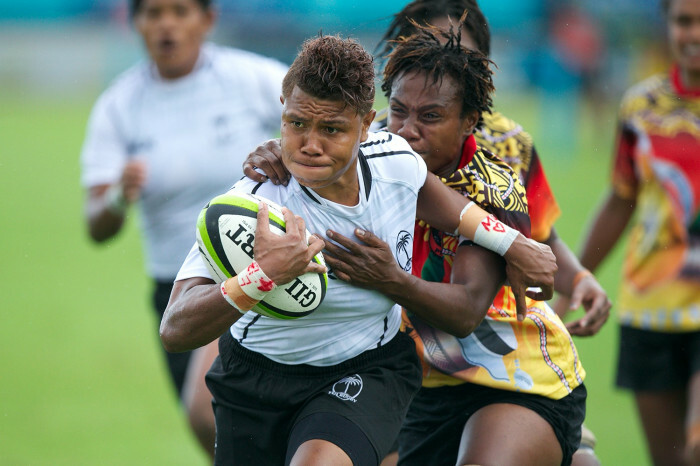 Fiji Airways Fijiana 15s Team Captain Lailanie Burnes is excited at the prospect of playing against their Pacific neighbours. “The last major test match for us at home was in 2016 and to run on and play with the whole grandstand cheering us on was a humbling experience,” Burnes said. “We know that we’ll be facing some tough games ahead, however, we will be giving it our all and we look forward to making our supporters and fellow countrymen proud,” Burnes added. Samoa and Tonga are expected to field strong line ups, with players playing provincial and club rugby in New Zealand and Australia expected to join the respective squads in Lautoka for a chance to play International Rugby. The Oceania region’s success across both forms of the game on the World Rugby stage continues to be a major catalyst in inspiring young girls to take on the game in the region. “We have the Black Ferns who are World Champions (XVs) and the New Zealand Women’s 7s team who are Commonwealth and World champions, not to mention current Olympic and HSBC SWS Championships Australia,” Cook commented. He highlighted the growing influence of Pacific Island women in Rugby and their presence in the International game, where Team Captains for New Zealand, Australia and U.S.A are all of Pacific Island decent. “There’s natural talent and leadership in this region, and we want our women to have an equal footing with the men to be the best they can be in Rugby for a chance to represent their countries,” Cook said. All matches will be played at Churchill Park, Lautoka.